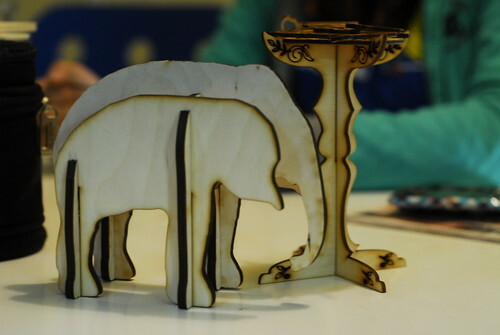 When Ry came in with his daughters to do some lasercutting the other day, they reminded me that Thingiverse is awesome. They cut this pretty little table, some tiny keys, and this cute little standing elephant, all from files off of Thingiverse. There are tons of neat plans and files like this on the site made for the MakerBot or the lasercutter. Thingiverse is more than just a place to find fun lasercutting projects; it’s made to promote sharing. If you have a cool design on file, you can upload it to Thingiverse and share it with the world. We here at Metrix like sharing so much that we’ll give you a 20% discount for anything made on the MakerBots or the lasercutter from a Thingiverse download. Share and save!